Bareilly Ki Barfi second song Nazm Nazm out! Home Gallery Bareilly Ki Barfi second song Nazm Nazm out! 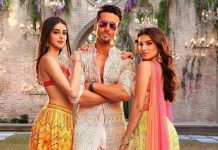 Upcoming romantic comedy film Bareilly Ki Barfi is one of the few films which has already caught the attention of the audience even before its release. The trailer seems funny and promising and now the makers have dropped the second song Nazm Nazm. The song is a sweet romantic song featuring Ayushmann and Kriti. Nazm Nazm is composed by Arko and features Ayushmann and Kriti and their romance in love letters. The first song of the film Sweety Tera Drama was received well by the listeners. Even the trailer of the film looks promising and has left the audience wanting for more. The film is directed by Ashwiny Iyer Tiwari and is ready to be released in theatres on August 18, 2017. This will be the first time Ayushmann and Kriti have been paired while Rajkummar Rao will be seen creating a love triangle in the flick. The story has three main characters played by Ayushmann, Kriti and Rajkummar. Kriti will be seen playing a young contemporary girl from the state of Uttar Pradesh, India while Ayushmann is a printing press owner. Going by the trailer, seems like Kriti is an ambitious girl who dreams big while Ayushmann and Rajkummar are the characters who are head over heels in love with Kriti’s character. Next articleSalman Khan shoots for Bigg Boss promo?